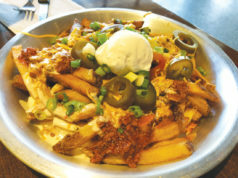 Ever bitten your lip so badly while eating that it ruins the whole meal? That’s what happened to me. 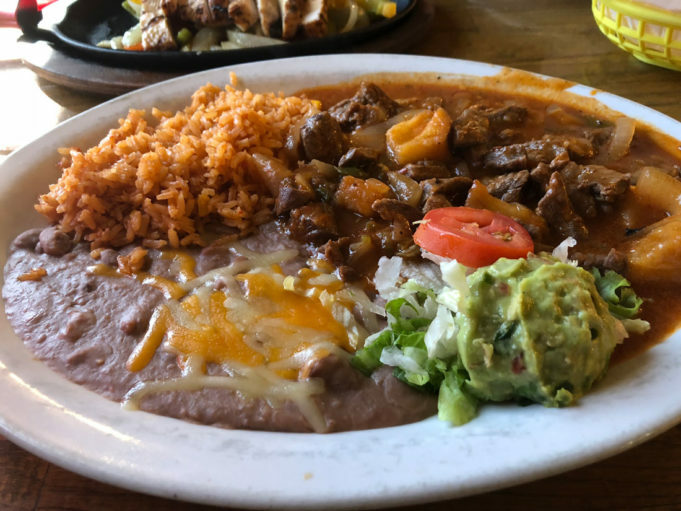 I was checking out Mezcales Mexican Bar and Grill (5532 Jacksboro Hwy, 817-625-0004) as a part of this grand idea to write about a few under-the-radar joints on Jacksboro Highway. 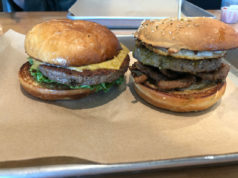 After wounding myself in the food-tasting area of my body on the first bite, the rest of my lunch was a struggle. Few businesses on that stretch of concrete jump out more than the brightly colored green-and-yellow stand-alone building that houses Mezcales. If the paint job doesn’t grab your eye, there’s also what looks like a former oil derrick that has been converted into a shabby windmill in the parking lot. The place used to be a Texas steakhouse, so I imagine that set piece is a holdover. Nothing says “eat meat” like gushing oil. There are three spacious rooms inside, one of which is a dark bar, with TVs blaring and comfy booths. The other rooms were your standard-issue brown-hued Tex-Mex kind of spaces but nicer than most. After my injury, I fought through the pain to enjoy my lunch portion of the beef guiso (8.89). The amalgam of beef tips stewed in red sauce with jalapeños, onions, and potatoes and served with fresh-tasting guac desperately needed more seasoning, but it still qualified as a great bang-for-buck lunch. I feel the same way about my guest’s chicken fajitas ($8.99). Mezcales seems like the kind of place you go when you can’t figure out where else to go: inoffensive, plentiful, and cheap. My lip was a little better the following day when my guest and I dropped by Addy’s Café (6038 Lake Worth Blvd, 817-862-7912). The venerable greasy spoon is under new ownership, so if you’re expecting the same chicken-fried whatever … you can still order it. You can also try the kitchen’s outstanding beef goulash ($10 at lunch), which is mysteriously listed in the “chicken” section of the menu. Addy’s version of the traditional Eastern European stew-like dish is served in the old-world style: tender beef tips swimming in a not-too-thick sauce of tomatoes, onions, and other veggies, all piled onto a generous portion of fettuccine noodles. The majority of the rest of menu still reads like diner fare, but there’s an interesting-looking seafood section I never explored. After my great experience with the goulash, I wanted to see what else the kitchen could do. On a subsequent visit, my guest and I sampled two of the features written on a board bordered by blinking lights. 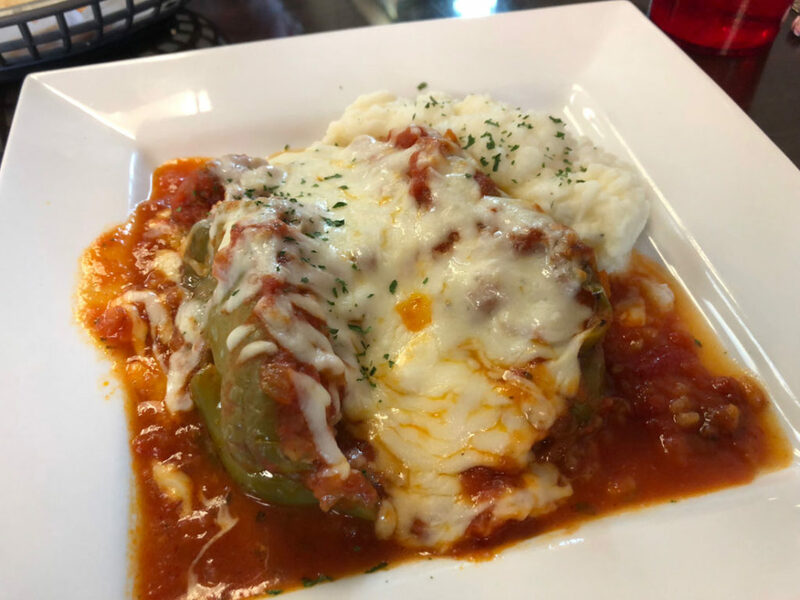 My stuffed bell pepper ($10), a green bell split like a hot dog bun and crammed with rice and meat sauce and slathered in mozzarella, was a high-comfort gooey gut-rocket. My only problem with the dish was the out-of-a-box mashed potatoes served alongside, which tasted more like wet cotton than a real spud. My guest’s portion of Eric’s Chicken ($11.95) was tasty and decadent, if confusing. It was basically under-seasoned Chicken Alfredo, which is made with mozzarella, topped with more mozzarella, two limp strips of bacon, and mushrooms, and piled on pasta. I don’t know who Eric is, but it sounds like he went light on the salt, thinking that the bacon would hold that role. It didn’t, because the kitchen didn’t chop the bacon and distribute it throughout the plate. It’s probably for the best that the chicken wasn’t salted enough. It would have just hurt my lip. 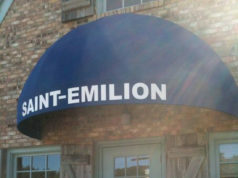 I totally disagree with your assessment of the potatoes, and Erics Chicken at this restaurant. Maybe your injured lip put your tastes off the mark. Usually I heed your advice regarding Fort Worth restaurants but this time I feel that you missed it. Additionally, your remarks seem a bit more sarcastic than necessary. Lastly, regarding the Mescales Mexican food restaurant,,,, while it isn’t my favorite as well, you were incorrect about the structure outside. It was never a gushing oil derrick. It is and has always been a windmill. With the top windmill portion destroyed by the severe weather in the area from last year. They never had it repaired, I am sure due to expense. Your statement regarding gushing oil and eating meat was off base. Thank you for your comments,, maybe a lighter frame of mind could be in order as these are all hard working people trying to serve up some pretty tasty fair. Either you like or or not, but if your going to be sarcastic, make it very well deserved.